The South Korean government will invest 1.5 trillion won ($1.34 billion) in developing new technologies and creating a manufacturing hub for next-generation chips in order to keep its leading position being sought by China, according to the Ministry of Trade, Industry and Energy on Monday. The ministry plans to begin a process for a feasibility test on Aug. 8. 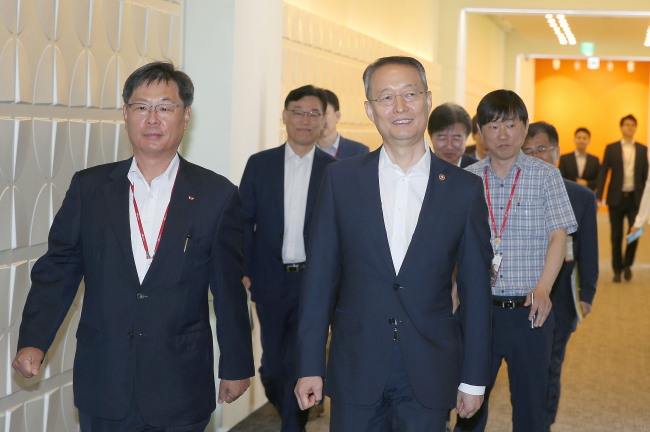 Industry Minister Paik Un-gyu announced the government’s plan during meetings with semiconductor industry officials at Samsung Electronics’ memory fabrication plant in Pyeongtaek and SK hynix’s in Icheon, both in Gyeonggi Province. The meetings were held to promote investments in the chip industry and discuss countermeasures for competitors like China, which is rapidly chasing after Korea with massive investments. “Korea will develop next-generation diodes and materials that will replace existing memory chips such as DRAM and NAND flash that have reached technological limits,” Paik said. The government will also foster fabless and foundry businesses by helping system-on-chip developers get easier access to manufacturing facilities. While Samsung and SK hynix take up nearly 70 percent of the global memory chip market, the Korean chipmakers account for less than 3 percent of the non-memory market, according to ministry data. To support fabless companies, the ministry will open a center for SoC development, which will back launches of those firms. “Korea will also create a global manufacturing hub by attracting semiconductor equipment builders and material makers from other countries to establish their production lines in the country,” the minister said. The ministry will come up with deregulatory measures and investment incentives for companies including AMAT and Air Products & Chemicals from the United States and ASML from the Netherlands. Paik also expressed his gratitude for the Korean chipmakers’ efforts to continue their investments, and encouraged them to do more. SK hynix on Friday announced an investment plan of around 15 trillion won for an additional memory chip fab in Icheon. The chipmaker will break ground for the new plant at the end of the year. At Samsung’s Pyeongtaek complex, Paik was briefed on the company’s execution of an investment plan worth 30 trillion won that was first announced in 2015. The minister also urged Samsung to take the lead in aggressive investments in the near future. 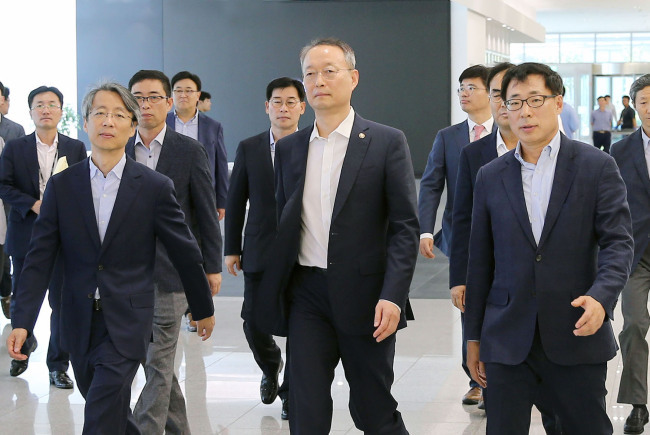 Kim Dong-yeon, deputy prime minister for economy, is expected to visit the Samsung plant in Pyeongtaek next week to discuss the tech titan’s upcoming investment and job creation plans. Samsung heir Lee Jae-yong is anticipated to attend the meeting.